Bunnies are adorable and so fun to include as we do Easter crafts and activities! 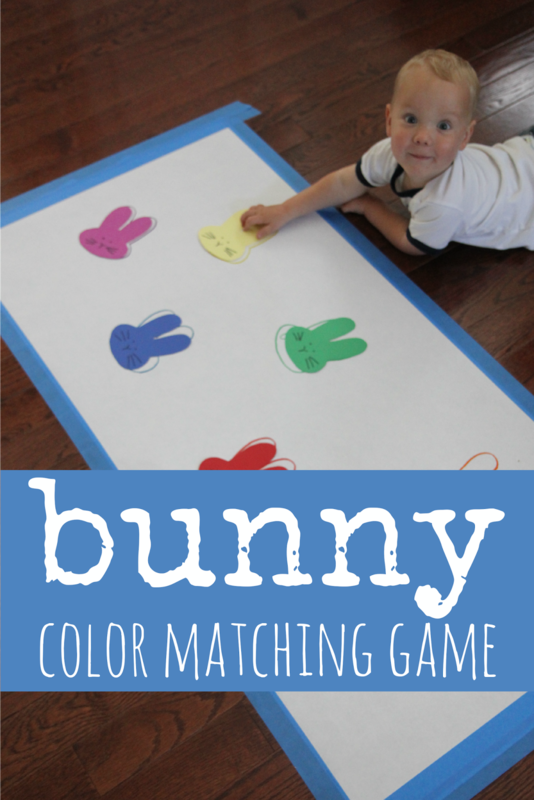 Today we're sharing a super simple bunny color matching game that we created. You can also check out our other favorite bunny activities in our 9 bunny crafts and activities post. To make our bunny color matching game you only need a few materials. The point of this color matching game is to explore colors, notice differences and similarities in the colors, and introduce color names to kids. To create the bunny game first you need several colorful bunnies. I traced the bunny template onto colored cardstock to make our bunnies... and then I added eyes, noses, and whiskers. Next I taped a large piece of white paper to the ground with painter's tape and then I traced several bunny patterns so that I had lots of bunny shapes on the white paper. I traced over each bunny with a different color and wrote the correct color on the correct bunny. Once the bunnies were made and the bunny board was ready, we started playing! Sometimes we started off by hiding the colorful bunnies first, finding them, and matching them. Sometimes we just matched them. Once all of the bunnies were matched, we pulled them off and played again! This game got our bodies moving and our brains working! We also love activities that get us moving. If you are not already busy, try out our bunny movement activity too!